There has been much discussion about the digital revolution at the turn of the present millennium. Changes at the turn of the century before, however, were probably far more dramatic to a person born in the middle of the 19th century than what we are seeing today. A person growing and living on the shore of one of the Great Lakes would have witnessed many dramatic revolutions in technology as economic conditions in transportation forced rapid changes in the types of ships and cargo plying the lakes. In the short span of about fifty years, sail would evolve into steam, steel replace wood, and lighting would become electrified, replacing the oil lamp. As ground transportation developed as an alternative to lake travel, passenger steamers would be transformed into the bulk carriers still traveling the lakes today. The years just before and just after 1900 were a very busy time for shipping on the Great Lakes. Heavy traffic mixed with fog, cavalier captains, and late fall and early summer gales made the sailing or steaming on these lakes the most hazardous on earth. Thousands of ships have blown ashore, foundered, exploded, burned, or collided during the last 150 years. The last major shipwreck, the Edmund Fitzgerald, occurred in the 1970’s off Whitefish Point, in Lake Superior. 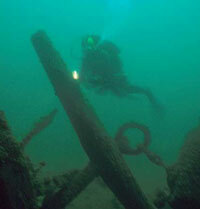 Many of these wrecks have been found, and are dove each summer by scuba divers skilled in the art of Great Lakes diving. Each shipwreck is a window into the technology, customs, and craft from the era in which it was built. No two shipwrecks or ships are exactly alike. 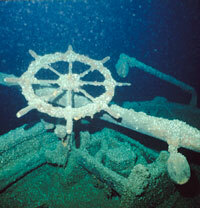 Most of the wrecks lie within underwater preserves, and are buoyed. All shipwrecks are now protected, so no artifact collecting is allowed. 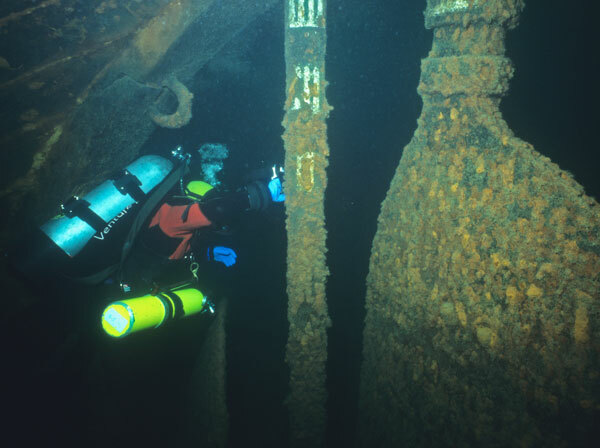 Information on where to dive these wrecks is available from the various states and provinces around the lakes. Continuing research leads to more discoveries every year and, because of the ban on artifact collecting, these wrecks tend to be the most interesting to dive. All have a story to tell.